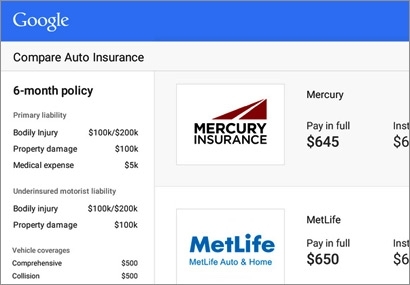 Google confirmed earlier reports with the launch Thursday of the Google Compare for Auto Insurance comparison-shopping tool that allows consumers to compare rates from different providers. The option pops up after a consumer searches on google.com for car insurance. The service is available to California residents, but other states will soon follow. Consumers can either go to the new service's landing page and type in their ZIP code or enter the query in the search engine box. A gray questionnaire box appears asking for a ZIP code and other information about the vehicle. If searchers choose to fill out the form, Google returns a comparison guide listing insurance premiums, provided by its insurance advertising partners. Think sponsored ads. Insurance provider participating in the service includes Mercury, 21st Century, Titan, MetLife, Infinity, Stillwater, General, Kemper, CSE, and others. The quote tool returns up to 14 comparison prices. The consumer has the choice to buy online or click a button that transfers the call to an operator at the insurance company of their choice. The tool requires the consumer to enter information, such as birthdate, make and model of the car, level of education, employment status, type of home, and marital status, as well as questions that consumers might never hear from an insurance company like membership in associations, and education and training in driving situations. The ability to cross-market and cross-target services and products will grow with the wealth of data input into the system. Forrester Research Analyst Ellen Carney told Search Marketing Daily in January that the comparison tool for the U.S. market kept getting pushed back until Google's acquisition of CoverHound, a San Francisco-based company that manages premiums from Progressive, Safeco Insurance, Travelers and many more. Carney also said documentation she found suggests Google is authorized to transact business on behalf of Dairyland, MetLife, Mercury, Permanent General Assurance, and Viking Insurance of Wisconsin, along with others.